I've lost count of how many times I've visited the American Museum of Natural History in New York, but I can tell you this: It never gets old for me. There's something equally comforting and eerily magical about visiting the Hall of African Mammals and seeing the wise, old face of the lion--again. He's my favorite animal in the whole museum (with a respectful nod to the 94-foot-long, 21,000-pound Blue Whale that somehow hovers weightlessly above us). The museum itself is a study in opposites. It alternates between darkness and golden light. (If I had to pick one color for it, I'd pick cinnamon.) It's crowded--always!--but as you study the tiniest details of the exquisite dioramas, a part of you fades into them and it feels like you're the only person in the world. I visited the museum this past Saturday with my children--not for the first time. I think I've lost count of their visits as well. As they dashed from one diorama to another, they were mesmerized, balanced in a place of peacefulness and wonder. I felt it, too. It's a warm feeling that washes over me every time I walk through the doors. I hope the week ahead is full of peaceful wonder for you. 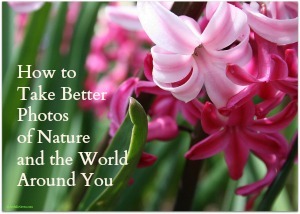 Start off the new year with a new skill: My photography e-course, "How to Take Better Photos of Nature and the World Around You" will be running again this January! Save $15 with the Early Bird Discount if you enroll before Wednesday, December 3, 2014 at 11:59 pm EST. (If giving the course as a gift, please let me know the name and email of the student in the PayPal comment section at checkout.) Click here for details and registration.